Welcome! My name is Laura. 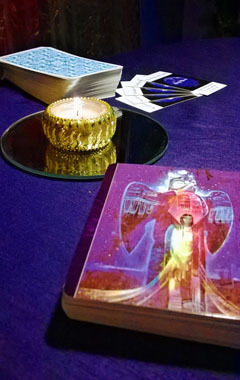 I offer comprehensive tarot readings via phone or email and distance Reiki healing sessions. I specialize in reading the future. My clients report back that I am very accurate. Why should you book a session with me? I cover everything - I get to the core of issues presented and questions asked. I provide very detailed responses. Ask and you will know. I will get to the bottom of any problem and offer solutions and multiple outcome forecasts. I am available for phone readings on Tuesdays and Thursdays, 9:00am to 3:00pm PT, and Fridays for in-person meetings.